This was a great hotel for us. We were 3 adults and a dog, and the room was plenty big enough. The beds are comfy and the shower was excellent. Clean and big bathroom. The breakfast had lots of options and was kept well stocked. The pool was clean (a bit cool) and the hot tub a nice curative after our hike in the swell. Right next door to the JW Powell museum which was a treat. Nice dog spaces with poop bags provided! The darkening shades allowed us to sleep in. We brought our dog and had a great time. The room was clean and there was a nice gravel pet area on the side of the building. The waffle breakfast was delicious and we didn't have any problems with the service. The bed was firm. Stayed at first choice inns or should I say worst choice inns!!! (Green river Utah). This place has clean rooms and terrible service! Extremely upset at the horrible staff they were rude, racist, and not willing to help with anything. We were kicked out of the pool early because our children (toddlers) were having fun and they were “too loud”. They over charged us and didn’t give us the lower rate we found online. Breakfast was closed early at 8:30 and no exceptions were made (even though the sign says 6-9 a.m.) they threatened to charge for the complimentary coffee which they said we could have no more and it’s for other guest. our kids were starving and they told us “why don’t you check out your brown family and eat breakfast somewhere else” I will never come to this hotel again and would recommend anything else to everyone I know. I will be posting this to all 400k followers on Instagram and my over 400k followers on Facebook. My partner and I save to have a handful of vacations a year and this stay was by far the worst!!! I’ll be looking for a prompt refund from corporate and would highly encourage customer service training to all employees. Gabby and larrissa had to be the worst Employees I’ve ever seen! We have visited Green River yearly and have stayed in 3 of the hotels there, this one was a great escape! Clean rooms, pet friendly and the staff was very nice. Love that they have actual Utah photo art on the walls. We spent 2 days, enjoyed breakfast and the relaxed park in front. We will be back for sure! We decided to slow down and see some other sites on the way to CO. We need a pet friendly place for two dogs. The staff was good, room large, clean and very comfortable. I slept like a rock as did the pups. The grounds are lovely and our view of a park so soothing. The hotel was quiet and we had a good breakfast. We saw trees from the river and it was an easy walk. I went to Green River to visit family. Since one of them smokes, I retreated for 2 nights to sleep in clean air. The hot tub was the perfect temperature and the bed linens were soft. The bed was comfortable and the shower was good. The breakfast was usual fare. Lots of toppings for the waffles. It was a pleasant experience. Positives: Clean. When we were charged twice for the same stay, the hotel was quick and courteous to correct. Negatives: Noisy group of young men in the parking lot, partying from the bed of a pick up truck, maybe 10 parking spaces from the front door of the hotel. It was rather creepy getting our bags and walking through the dark parking lot while they set up a keg and were shouting and throwing beer cans at each other. To be fair, I am *assuming* it was cans of beer they were throwing. Our room had the peephole pryed out and tissue stuck in the hole. The safety lock was literally ripped out - shards of wood sticking out. It turned out this bunch were actually staying in the hotel, so the management turned a blind eye. A woman in a wheelchair was getting things out of her car at the same time we were, with this going on. No, best to just continue driving, or stop earlier. This place was a Holiday Inn Express when we booked earlier this year, but we were notified that they were booted from the chain and taken over by the new owners. Originally booked this hotel when it was a Holiday Inn Express. Received a call that they were no longer going to be part of IHG but decided to stay anyway. It's pretty expensive for what you get and we weren't able to acrue some IHG points. The room was fine and the pool and hot tub were nice. Breakfast was good. First Choice Inns at the Swell places you next to John Wesley Powell River History Museum and within a mile (2 km) of Green River State Park Golf Course. This 58-room, 3.5-star hotel has an indoor pool along with a 24-hour fitness center and free in-room WiFi. Free continental breakfast is included with your stay and awaits you each morning from 6 AM to 9 AM. At First Choice Inns at the Swell, guests enjoy an indoor pool, a 24-hour fitness center, and free WiFi in public areas. A stay here includes free parking. The 24-hour front desk has staff always at the ready. 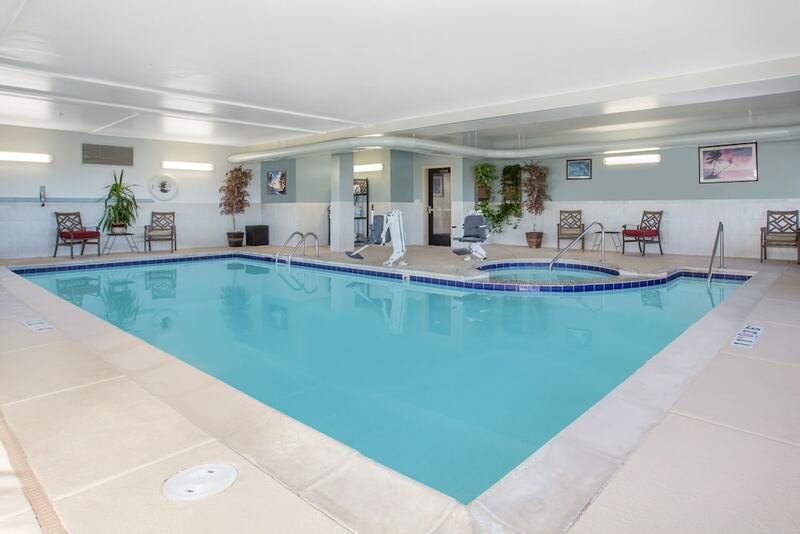 Recreation features at First Choice Inns at the Swell include an indoor pool and a 24-hour fitness center.